Great hotel, great staff, amazing views! We spent my birthday week at Kalestesia Suites and had such an amazing time and experience. The hotel sits high up south of the island with the best hotel views i have ever stayed in! We stayed in room number 2 which had a balcony again with great views of the pool and Caldera!! Our room was cleaned to a high standard with fresh towels provided daily. The hotel looks new as it is freshly painted and maintained by such amazing staff who also recommended some excellent places to visit. An amazing breakfast was served every morning on the terrace overlooking the south coast which could not be faulted. The staff here treat you like friends not guests which adds to the whole experience. Many thanks to you all for making Santorini more than we could ever of imagined and many thanks for surprising me with birthday wishes and cocktails! Thank you so much for your lovely comments and your excellent review. So happy that you've enjoyed your stay with us. It was really a pleasure meeting you both and we'll be even happier to welcome you again in Santorini and Kalestesia Suites! Take care! Greetings from all of us here! The price you found is 18% lower than this hotel's average rate of $196/night. The price you found is 19% lower than this hotel's average rate of $74/night. The price you found is 37% lower than this hotel's average rate of $195/night. The price you found is 23% lower than this hotel's average rate of $80/night. The price you found is 42% lower than this hotel's average rate of $654/night. The price you found is 41% lower than this hotel's average rate of $269/night. Thank you so much for your lovely comments and your excellent review. So happy that you've enjoyed your stay with us at maximum. It was really a pleasure meeting you both and hoping to welcome you again in Santorini and Kalestesia Suites! Take care! Greetings from all of us here in Kalestesia Suites. Breathtaking views! Staff is top notch! Everything about this place is amazing! From the moment we sat down with the host, we knew this place was going to be awesome! The host goes above and beyond anything we have experienced! And we travel frequently. The host made us feel comfortable and very welcomed! He made sure that we were taken care of. We got a superior room with hot tub and a caldera view and we felt like rock stars! Incredible view from our patio! All the staff were exceptional. Our waiter, the chef, the maid, even the maintenance guy made us feel so special. The food is amazing! The chef makes mouth watering meals. Also the onsite spa is quite nice. I can't say enough good stuff about this place... you will not regret staying here! Thank you for your kind words and your excellent review. It was a pleasure meeting you and we hope to welcome you again in Santorini! We came here for honey moon and was highly impressed by the perfect view of the room, the facilities, the meals and most importantly the great staff who showed personal care and provided very good services. Also the location is a bit further from the tourist area which Gave is a piece of mind. You will never regret it. If we had a chance to come again, this will definitely be the choice again! Thank you Leandro for your excellent review! We are glad that you enjoyed your stay with us and we look forward in welcoming you again in the future. 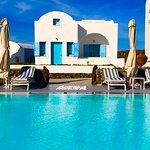 Kalestesia Suites is beautifully located at the top of a hill in the village of Akrotiri. Views: sitting in your rooms balconies you can see whole of the Santorini and Caldera. Rooms: Clean and fresh with essentials changed daily. Most rooms are facing towards Caldera. AC is the s provided and effective. Staff: Staff is very helpful and ready to make sure you are served the best. Manager John is really helpful and has good knowledge of the local area. All his recommendations have turned out to be very good. Kitchen staff is very polite and skilled. Food: Chef’s food is excellent and I will recommend it for sure. After trying outside restaurants I can happily say that it is the best food in the area. Facilities: when we were there things were getting prepped for season. But I am sure once they are done they will be very good too. Swing pool and Bar: we enjoyed our quite time by the pool and hot tub in hamam. Bar staff is very skilled in making cocktails. Kalestesia Suites is located on top of hill which is good 20 minutes steep walk from village centre, we love walking so we did it all days. But for guests a free transport is available to and from village centre. This is a beautiful property with an amazing staff. It is located on the southern end of Santorini above the village of Akrotiri. 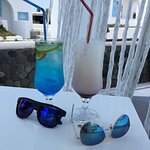 An excellent location to explore Santorini from without being in the middle of the major tourist areas. We rented an ATV that was delivered to the property. This was the perfect way to see the island, and we found some beautiful hidden beaches. The restaurant at the hotel was fabulous. The chef, Christos and waiters Thanos and Maria gave us personalized service and awesome food. Charis , the hotel manager was always available to us and provided invaluable advice and guidance. Theodore, the grounds keeper always had a smile and helpful hand. The staff at Kalestesia made a perfect vacation even better. Room tip: WE had a north end room with an amazing view of the caldero.